It is fewer than two years since Gary Neville was relieved of his duties at Valencia but for fans of the club, it feels like an age ago. In fact, many have probably wiped that dismal spell from their minds. The Englishman left the club in 14th place, just six points above the drop zone, with many suggesting that the problems ran much deeper than inept management and the club would take years to regain their status as Spain’s fourth biggest club. But what a difference 18 months can make. Los Che have gone through four managers since Neville departed, with the ever-reliable Voro stepping in following the sackings of Paco Ayestaran and Cesar Prandelli, before the recruitment of former Villarreal boss Marcelino last summer set them on the full road to recovery. Valencia now look like a side full of confidence with players such as Rodrigo Moreno, Goncalo Guedes and former Juventus man Simone Zaza flourishing under the new boss. Off the field, Mateu Alemany has so far proved to be a success as general director and the club are once again loitering in the top four places in the league. As of January 5, 2018, they were priced at 6/1 in the w/o Real Madrid and Barcelona La Liga betting market despite being just two points behind Atletico Madrid who were 1/7 in the same market. It is no surprise to anyone who follows Spanish football that Marcelino has enjoyed a good start at the Mestalla. He got Villarreal promoted in 2013 and took them to Europe on three occasions, reaching the semi-final of the Europa League in 2015/16. It, therefore, came as a surprise when he was sacked just before the first game of the 2016/17 season. Valencia did look to recruit him then but had to wait until May 2017 to finally secure his signature. Not since the days of Unai Emery have the Mediterranean club looked to play with such desire and intensity. But unlike his Villarreal side, Marcelino’s Valencia offer a much greater attacking threat. From Parejo, Kondogbia and Pereira through to Soler, Zaza and Rodrigo, there is an offensive mentality but also one of creativity, pace and hard work. While it is far too early to suggest that Valencia are back for good, all the signs are positive. And despite a blip in form over the Christmas period not helped by injuries and suspensions, they look to be on course for European qualification this term, with the Champions League a real possibility. A 1-1 draw at home to Barcelona in November summed up their renewed doggedness under their Villaviciosa born boss. They soaked up the pressure early on and then set about hitting their opponents on the counter-attack to great effect. 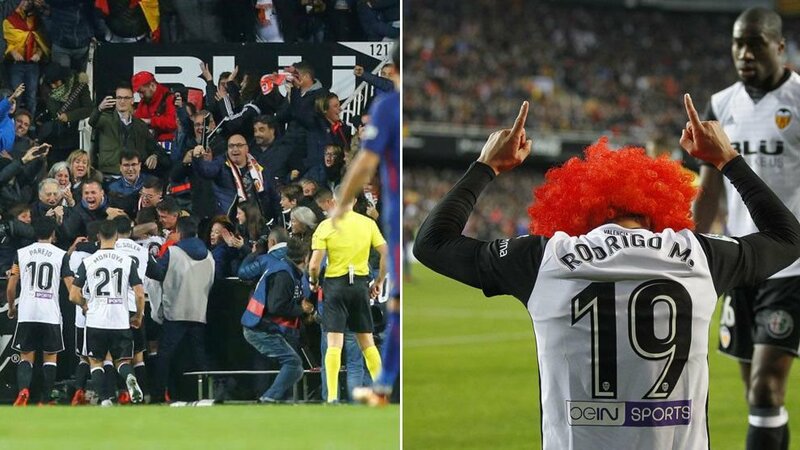 And by the time Rodrigo netted in the 60th minute, celebrating by donning an orange wig in tribute to former club president Jaime Orti, it looked as if they would go on to win the game. A late equaliser from Jordi Alba prevented the victory but the game exemplified how far the club had come since the dark days of Gary Neville.